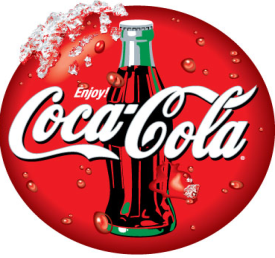 The company experience is the sum total of the experience of its people at any given time. We are fortunate to have a number of personnel with many years experience in their respective disciplines, both in HVAC & Refrigeration Engineering. 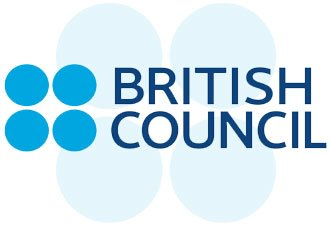 Additionally, we have established supportive relationships with a number of related engineering companies who can provide the necessary assistance, when required, in disciplines that are not covered by our core business. These include structural engineering, piping, electrical & instrumentation engineering. The company is, therefore, well experienced in the carrying out of any kind of assignments. Our personnel, as individuals, have also developed experience in a significant diversity and range of project sizes and types and this is reflected in the overall capability of our company. Our personnel are also well experienced in providing repair, installation and maintenance services. It is through the combination of the experience available within the company that we are well placed to support clients anytime with a wide range of HVAC & Refrigeration Engineering activities. 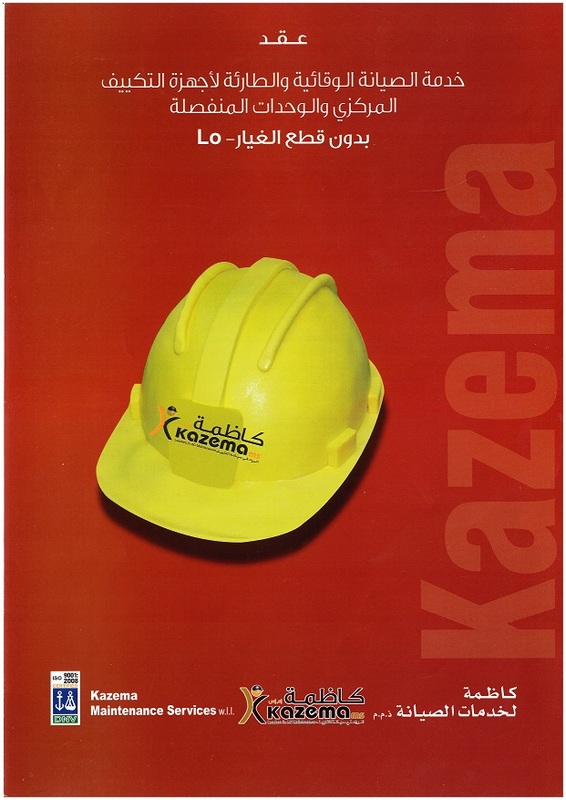 Kazema Maintenance Service Company referred to as Kazema MS is a company within Kazema Global Holding KSCH. With motivated, well trained Managers, Engineers, Supervisors, Technicians, Sales and Administrative staff with latest Computer Systems, Workshops, Service Vans and Operation Control Centre (Dispatch) providing after sales service to all of Kazema Operating Companies as well as it supports our sister companies by commissioning, air and water balancing, operations, preventive maintenance as well as it covers emergency and preventive services during the warranty period. 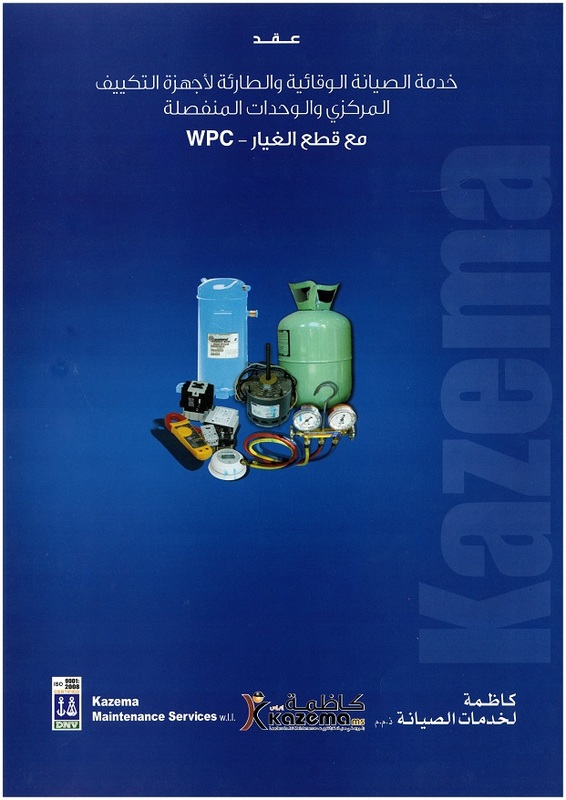 Kazema MS also has a large base of customers and on call customers, as well as it is highly entrusted for large maintenance projects where on site engineers and service staff is required. 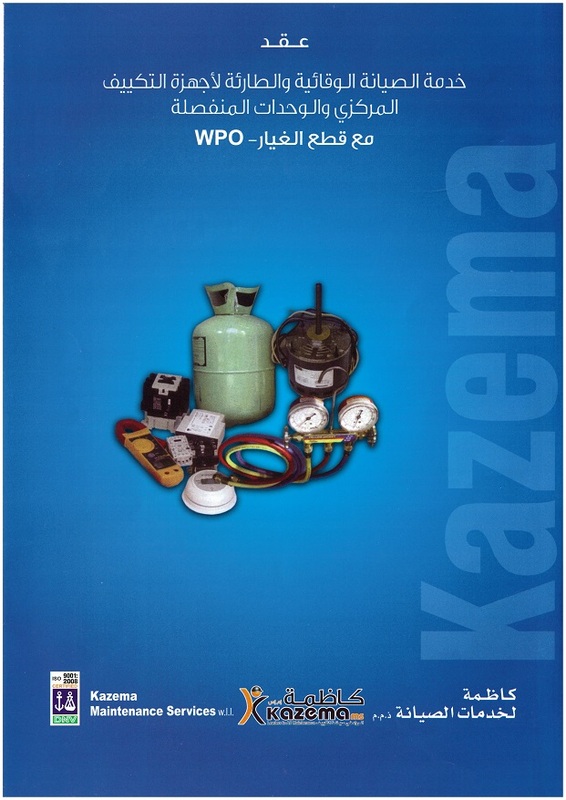 Kazema MS has its own workshops capable of providing repairs and overhaul services with facilities for compressor rewinding and units rebuild. Trained Engineers, Supervisors & Technicians. Computerized On line Customer Tracking System. Mobile Service Vans equipped with material and tracked by GPS. SMS service for receiving calls (in the development phase). 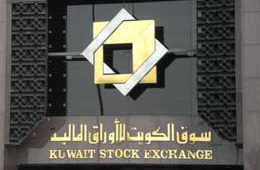 Workshops facilities available in all governorates of Kuwait. 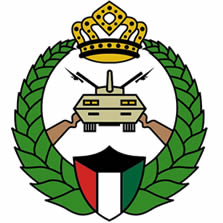 The operations are supported through various Kazema Offices ideally located in Shuwaikh, Al Rai & Subhan area. The Workforce has access to all required spare parts and unmatched supply of tools through the Grand Showroom and other showrooms located in various parts in Kuwait. Planned Maintenance is a system of activities necessary to halt deterioration and restore facilities or equipment to peak working condition. It improves up-time, the quality of output and reduces maintenance costs. Preventive Maintenance is carried out at predetermined intervals or according to approved criteria, with the purpose of reducing the likelihood of system breakdowns or performance degradation. These scheduled maintenance activities and systems and improves functioning of processes. Routine Maintenance is a program of day to day repairs that maintain equipment performance with minimal production disruption. We execute equipment checks to ensure proper functioning and continuance. Emergency Maintenance includes unscheduled repairs that need to be accomplished quickly to restore day to day operations and get production back on line. Assets and equipment unexpectedly stop functioning. You can expect Kazema MS to get you back to work. Labor only contracts without parts. Contracts with parts without Compressors. Contracts with parts & Compressors. Emergency repair services 24 hours a day, seven days a week. KMS is all time ready to repair & supportive. KMS offers 100% satisfaction guarantees on all Air-conditioner & Heating services.